The Slime Book: 30 Gooey Recipes You Need to Know to Make the Perfect Slime is new from DK! 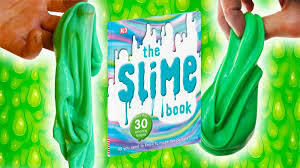 In 2017 we had bottle-flipping, fidget-spinning, and now we’ve got slime! The Slime Book: All You Need to Know to Make the Perfect Slime features over 30 gloopy, gooey, colourful slime recipes for you to make! Learn the science behind these slime creations with amazing, detailed fact boxes and use the book again-and-again thanks to the fun recipe variations. Are you ready to create slime? Then get goo-ing!